Item Number: 66-7-210 18220 Actual Weight: 2 lbs. 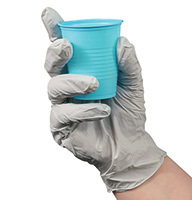 Non-sterile, ambidextrous gloves have beaded cuff for easy on and off. Textured fingertips make gripping easier and more secure. Extended cuff protects wrist and forearm. Helps meet OSHA requirements for exposure to bloodborne pathogens.